There is always lots of talk about working in the nonprofit field: what is fair pay, is there a reasonable work/life balance and are there opportunities for career advancement along with the many duties of the job. 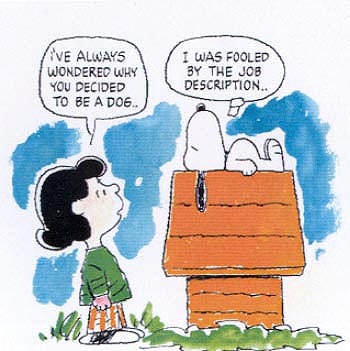 Reading through nonprofit job descriptions on the various sites is almost like a trip with Alice in Wonderland. Some are totally boring, a bulleted list that then require pages and pages and pages of forms to be sure you repeat unnecessary and irrelevant information multiple times. Some are a great, with clear language about expectations and qualifications along with a couple thoughtful questions. Some are exciting, showing the character of the organization and their interests. Some look like they were written after a chance meeting with the mushroom and make no sense at all. The job description below, however, stopped me in my tracks. Wow. All I can say is I would love to meet the person who can not only do all this work in less than 1/2 week, but to do it for slave wages. This ad is for a part time position as an Office MANAGER/BOOKKEEPER. We are a non-profit organization in need of administrative help. This position will definitely give the right person great experience and flexibility for growth! The person in this position will be working directly alongside the director of the non-profit organization. You will be responsible for day to day operations such as answering phones, writing and proofreading letters, taking minutes in meetings, updating the organization’s website and social media pages, filling out city documents, and other similar administrative duties. We are looking for someone to help us grow the company and who will be a great fit to grow along with us. Excellent spelling and grammatical skills for composing letters, proofreading, etc. Able to use WordPress – create pages, change menu headers, update plugins and find new useful ones, link social media to our site, etc. Knowledge of Photoshop a huge plus! This candidate must be someone who is really technologically savvy – if not, they will be lost as the majority of responsibilities associated with this position are technologically related. The requirements mentioned above are absolute MUST HAVES! If you are not familiar with these programs, please do not apply!!! This is an actual job description published on the web. The front line staff at your nonprofit are one of your most important assets, often their voice and face are the first impression visitors and guests will have of your organization. A good manager has a strong understanding to the function of the job on a day today basis, and asks for realistic performance. Good management means caring for your employees and not piling task after task on them just because it needs to be done. Be honest about what you want, what you need, what you can afford to pay. While it is great to have a blue sky wish list, the list above is frankly ridiculous. One of my favorite nonprofit bloggers recently posted- it gives very detailed suggestions about how do post a position well. I’d really love to hear what others think, please do comment. As always, thanks for reading, it means more than you know.